Just like a caterpillar breaking the cocoon, becoming a graceful butterfly, and flapping toward the brilliant new world, RGL team, established in 1992,has experienced all the challenges and tribulations in gear reducer and worm gear reducer field. Finally RGL broke through the perplexities heading on the bright future and becoming what we are now. In early stage, RGL have cooperated with Mechanical and Systems Research Laboratories and Electronics and Optoelectronics Research Laboratories of Industrial Technology Research Institute to develop the software and hardware for worm gear design and prove the best match between the worm gear and worm shaft. Furthermore, Instead of adopting standard cutters to manufacture gears, RGL has adapted the standard gear modules to toleranced gear modules and commissioned Japanese manufactures to process exclusive gear cutters for RGL. All those efforts have determined RGL's leading status in speed reducer technologies. RGL is entering a new era, we will keep absorbing new knowledges and offering professional services to our honorable customers. Please give RGL an opportunity if you are not one of RGL's customers yet. 1992 Regal Machinery is established , mainly produces worm gear reducers. 1993 Introducing gear reducers for wood working machinery . 1994 Assigned as the official supplier of Canadian company Power First. Introducing worm gear reducers of aluminum alloy. Assigned as the official supplier of many U.S. large scale companies. Introducing worm shaft driving rotation system for wheel type reducer. Introducing special purpose gear reducer for mechanical car parking system. Purchases production equipment from Switzerland, Germany and Japan for the capability of processing dual-lead, increases accuracy of gear reducer. Introducing aluminum alloy motor gear reducer of low temperature and noise level. 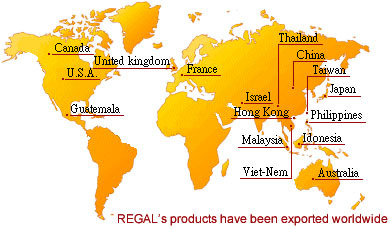 Market stretches out to Europe and USA, and establishes own website www.rgl.com.tw . Introducing new models of CE-conformed gear reducers. Assigned as the major supplier by US chocolate and ice cream manufacturers. 2010 Developing NC worm shaft forming machine with own R&D capability. 2011 Receiving Gold Medal Award of Taiwan Excellent Product. Worm shaft forming machine is patented in Taiwan. Worm shaft forming machine is patented in Japan. Worm shaft forming machine is patented in China. Ding Shen Machinery Co., Ltd. Is established for producing NC worm shaft forming machines.